How to say what is this in the Nepali Language:- Every community has their own language to speak which is also known as their identity. Like those Nepalese also has their own language which is known as the Nepali language. Nepali is a language that is not too easy to learn. It’s more complicated than the English language as there are many symbols to be learned from knowing the language. All the language are difficult if it is not your first language. Similarly, the Nepali language will also be very complicated and hard to learn if it is not our first language. Well, it doesn’t mean that it is impossible to learn. If you have a keen interest towards the Nepali language than you can definitely learn Nepali language but for this one need to have dedication. To learn any language you need to know the different phrases that are used to speak that language. Similarly to learn the Nepali language we need to learn different phrases that are used in the Nepali language. If you keep those phrases that are regularly used while speaking than one can easily learn the Nepali language. If you try to learn few phrases like what are you doing, shut up, you are very pretty are some of the phrases that one can learn to say in the Nepali language. There are many phrases in Nepali language but we can learn only a handful of it which are used on a daily basis. If we learn only those handfuls of phrases and keep in mind and learn those one at a time, you can slowly learn the language fluently in no time. If you are interested in learning the Nepali language than you need to learn the different phrases that are regularly used like shut up, or you are my life or the phrases that are frequently used in the Nepali language. Actually, one can’t be fluent in speaking the Nepali language we need to learn how to say the actual phrases, which is more important to learn usual expression in Nepali. We should know that in the Nepali language there are three standards of phrases for showing respect. Definitely, there is a different way of saying to the older people that we do in a much-respected way. Similarly to the one who is of your age we talk in different ways and to the one who is junior to us we speak in another way. So we need to know what type of sentence is used to which group of people. The sayings also differ from person to person or to whom we are referring it. People are very curious to know different things. Our country Nepal is a country of Himalayans so many tourists from all over the world come to visit here and see the natural beauty of it. Well, we also know that even though our country is rich in natural beauty we people of Nepal are backward in other things like living standard education and so on. due to this many of us don’t understand any other language except our own mother tongue. Well, there are many languages spoken in our country by many different communities like Sherpa, Tamang, Gurung, Newar and so on. so sometimes speaking the Nepali language also become difficult. That is why it would be easier if we know certain phrase to speak the language so that we do not need to take the hassle of learning everything from that language. When we see new things we have the curiosity of knowing it. We eagerly want to know about it. Well if we don’t know how to ask about the things in the proper way then we will definitely not be able to get the answer. So there is a different way of asking a question about it. We can ask everyone the question like yo k ho when we see new things. This phrase is very simple and is easy to learn even for the beginners as well as for the moderate learner. Similarly, the people of different community within the country who have the difficulty in speaking Nepali language people when meeting the only Nepali speaker this phrase is very helpful. In every community, we have the languages that are used in all the community. Well, there is a different level of respect that is found in the Nepali language. To the senior, we greet in a different way whereas for the people of same similar age are greeted in a different way whereas for those who are junior to us we talk and greet those in another way. The respect also matters while speaking in the Nepali language. The above phrase is used to ask the question to the senior people of our community in the Nepali language for what is this? The simple translation of what is this is yo k ho but we can’t ask directly yo k ho to the elder people of our community so we use the other form of language and the phrase that is associated with this level of respect is tapai lai tha cha yo k ho? This phrase is widely used for the senior people and to all those to whom we directly can’t ask a question of simple translation from the English language. This phrase is very useful to those are interested in speaking Nepali language and also want to learn the Nepali language. 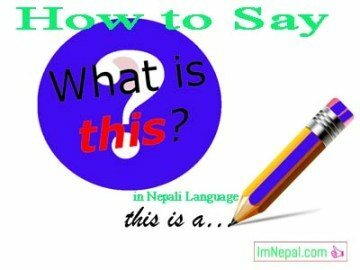 The different ways of asking a question to the English language what is this in the Nepali language are different. We can use any phrase that suits the situation and the people around you. We can also ask the question of what is this ?is yasko name k ho? This Nepali phrase is also used in the different condition. While we are walking around and if we see something strange or something that we are unknown about it than we can use this Nepali phrase yasko name k ho to those who are available in the place at the meantime. Well while asking the question yasko name k ho we are using middle level of respect. Well as we are not indicating to whom we are asking it may be to the stranger who is available in the spot at the time of question arise. This phrase is very useful for learning the Nepali language. It is not always the case that we find someone who is respected by us. We always need to show the respect. Sometimes the confusion arises when we are with our mate or friends. Well, lets say when we are surrounded by the people of our own age group. In the simple speaking language, we use to our friends oye yo k ho? To the English what is this question? This phrase can be translated into Nepali phrase in many ways which can be used according to the requirement of the users. Well, it is said that there are many ways of saying the same English phrase into many different ways. One English phrase what is this has many different ways of saying in the Nepali language. The different form of saying it is oye yo k ho, k ho etc. The phrase k ho is used to ask a question in Nepali language. This phrase is used to ask a question to the people around you where it doesn’t matter whether the relationship is for the senior or junior. It also can be used to the stranger while passing the place and if we see the strange things then we ask the question using the phrase k ho? Whoever is available there at the time. As we know there are different levels of respect in the Nepali language. The level of respect is determined from high level to the low level. The high level of respect is given to the senior people than we that are like a grandfather, grandmother, parents, and the people who are senior to us. Similarly, the middle level of respect is given to the people of the same age or to the colleague. Similarly, the low level of respect is given to the junior people or to the people who are smaller in the job position and so on. Here the above phrase hujur bhannu na yaskoname k ho? This phrase for English sentence what is this? In Nepali to the senior people while asking a question we use the above phrase hujur bhannu na yasko name k ho? This phrase is normally used the higher level respect. This type of different phrase that is found in Nepali language has made the language more complicated and more difficult for the beginner learner. The other phrase that is used in the Nepali language for the indication of what is this? Is talai tha cha yo k ho. This type of phrase is used for the same age people and this phrase is used for the low-level respect and is used for the friends and other nearer people who are very close to you. The phrase talai tha cha yo k ho is widely used for the friends and other people of your school and college and so on. we also used the word that to the childhood friends and the people who are very close to you in your life and if we need to ask any sort of question regarding anything that we don’t know then, we used this above phrase. Nepali is the language which is complicated and difficult to learn if we are not from the Nepali community. The grammar and the other structure that are used are very complicated to learn. The language more easy and interesting if we show a keen interest in it. There are different ways of saying the same things in different ways like oye yo k ho? Talai tha6 yo k ho or we also can say that timlai tha cha yaslai k bhanincha etc. similarly we also can say that what is this in the Nepali phrase yaslai k bhanincha? This is also one of the simple and easy ways of asking about the what is this question? Above listed are the few ways of saying the phrase what is this in the Nepali language. Here we have listed some of the phrases about asking what is this in the Nepali language. Here we have listed both formal as well as informal way. Anybody who knows Nepali would instantly understand and reply with the desired answer that you are seeking. However, make sure you are asking as per the level of respect that each of these phrases mean. Some can be used for seniors or someone who is higher in position to you and some can be said to your counterparts. Still other can only be said to the juniors as an informal way of asking the same thing. So you need to learn the phrases accordingly and be very careful while saying those. As we know that Nepali is not the simple language which can be learned and used easily. If your tongue isn’t Nepali, then it takes a significant effort to find out the language. As we know Nepali is not a straightforward language and anyone who is not the native speaker of the Nepali language may not be easily spoken as the pronunciation is difficult. But if we try learning the language one phrase at a time and always keep in mind the phrases that are frequently used and learn those one at a time, then you will be able to slowly learn the language tolerably. Knowing what in Nepali is one such phrase. You’ll be able to use it in a very routine in the day to day life. So it’s a phrase that you simply would possibly need to find out if you’re interested in learning things in Nepali. Before learning the way to say the particular phrase, it’s necessary to find out a number of the same old expressions in Nepali. One ought to perceive that in Nepali you have got 3 standards of phrases for showing respect. For people who area unit older to you and you wish to point out respect, you have got to mention the constant issue in a very totally different manner. Whereas, if the opposite person is younger to you, the constant issue will and will be same in a very abundant totally different manner. So, constant issue differs betting on the person you’re speaking. If the opposite person is your senior, junior or your friend, the constant phrase has other ways of claiming it. Therefore, whereas learning the way to say the given phrase, keep it in your mind that constant issue has 3 other ways of claiming it betting on the one who you’re concerning.